SHETLAND is fortunate to have a relatively high employment rate compared to other rural areas of Scotland. However, there are people living in the isles who face barriers to employment arising from struggles with mental health, a criminal conviction, substance misuse and long term unemployment. The Shetland Bike Project is a charitable organisation that helps remove these barriers and stigmas, enabling people with substance misuse and mental health issues to be accepted into a supported working environment whilst learning a skilful trade in bicycle mechanics. 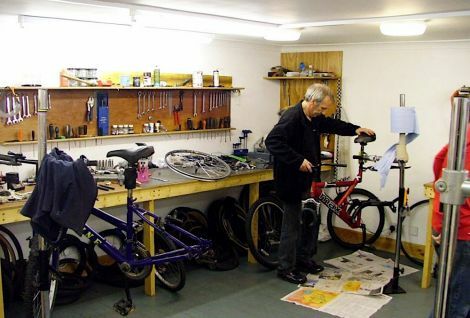 Established in 1999, and based on Commercial Road in Lerwick, the bike project renovates, repairs and sells bicycles, as well as providing bike maintenance and repair classes to school groups and youth clubs. The project is managed by Caroline Adamson, who along with two other full-time members of staff currently oversees six project trainees. She explained that the trainees could be referred from any source, for example from criminal justice, the job centre or mental health services. “This year we have to date provided six waged places which enables trainees to be paid a minimum wage enabling them to get a reference, training and work experience,” she said. “We can employ people for up to 1 ½ years and so far we have had a 90 per cent success rate of helping folk back into further employment. The bike project will support up to 25 individuals during the year. The fact that the project provides a supportive working environment is certainly an important part of its success and empowers trainees to turn their life around to a more positive way of living as full time bike mechanic Drew Hamilton explains. “This place has changed my life,” he says, “when I first came here I wasn’t the person I am now. I was a bit of a nervous wreck, I couldn’t speak to people, I couldn’t even look at people. “Now I’ve got more confidence, can speak to people easier. I’ve been here for two years. I’m 22 now. Before I was here I was struggling with drugs and drink but coming here has changed my life for the better. Drew’s position is funded by Community Job Scotland and Scottish Employment Recruitment Incentive. He started as a trainee but has worked his way up to be a project worker, supporting and teaching new trainees in the workshop and helping in the shop. Although bike sales and repairs do generate a healthy portion of money for the project, funding plays a vital part with funds received from Shetland Drug and Alcohol Partnership, Fairer Shetland Fund and Community Jobs Scotland. Most importantly the project would not survive without donations of bikes from the public, which enables the trainees to refurbish and rebuild bikes which are then sold in the shop as functioning second hand bikes. 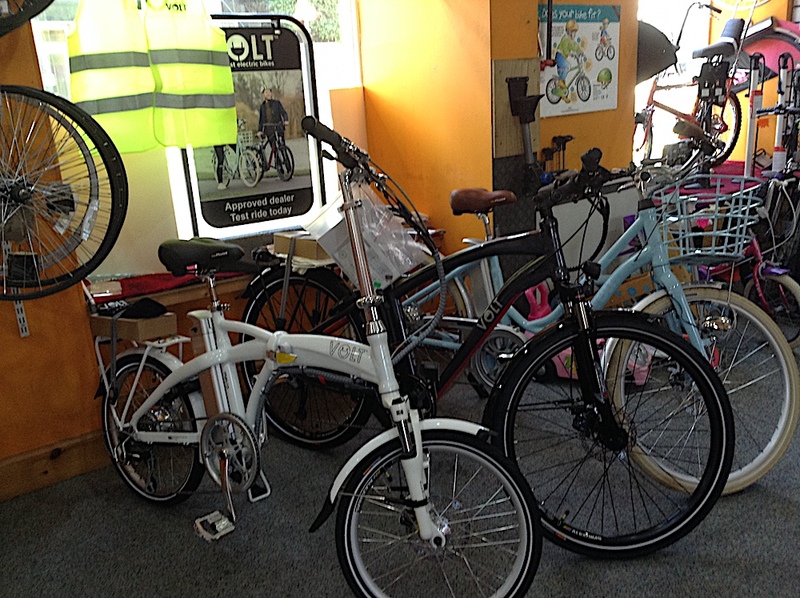 The bike project shop is also a dealer for UK e-bike manufacturer Voltbikes. As well as selling bikes they also provide a bike rental service which according to Caroline has seen a “high demand for this year especially from visiting cruise ships with visitors opting to cycle around Lerwick and the surrounding area during their visit. We are in the process of applying for funding for six electric bikes that will be rental bikes which will generate income for the project as well,” she adds. 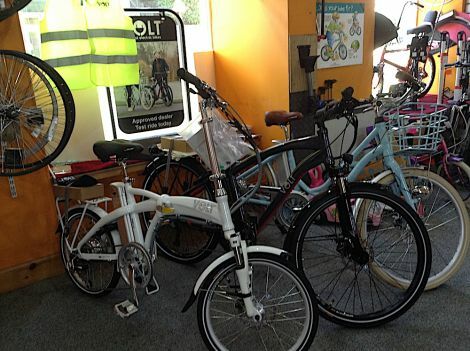 They currently have three electric bikes for sale in the shop and are a dealer for the UK e-bike manufacturer, Voltbikes (www.voltbikes.co.uk). Through Volt anybody can buy an e-bike through a purchase scheme with a zero per cent interest rate therefore costing as little as £2 per day. The aim is to make e-bikes more affordable. 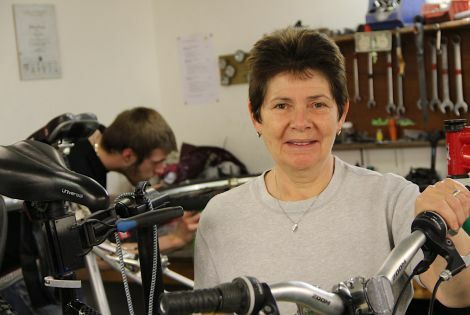 “There has been a lot of interest in e-bikes so far as they help make cycling in Shetland slightly easier and hopefully more enjoyable,” Caroline says. The Shetland Bike Project shop and workshop hours are Monday-Friday 9am-4pm, Saturday 9am-12.30pm. For more information on bike rentals, e-bikes or the work of the bike project please contact Caroline Adamson: mail@shetlandbikeproject.co.uk or telephone 01595 690077.